The IDFA in the Netherlands, the Listapad in Belarus and the Escales Documentaires in France are the festivals at which a strong representation of Polish documentary films will be present. Where else can you watch Polish productions in November? As soon as on the 1st of November starts the festival Early Bird in Bulgaria, where the following documentary films will be shown: "Between Us" by Maciej Miller, "How to Become a Pope?" by Justyna Mytnik and "Dust" by Jakub Radej. This month, the short documentary film by Radej will be shown four more times, among others, at the Lubljana International Film Festival in Slovenia, at the Court en Scene in France and at the Start International Short Film Festival in Azerbaijan. For the documentary film by Justyna Mytnik, there are three more screenings in store, among others, at the Kasseler Dokfest in Germany. Both documentary films will be shown in France at the Escales Documentaires. There, focus on Poland will be held, and the following films are included in the programme: "Opera about Poland" by Piotr Stasik,"The Beksińskis. A Sound and Video Album" by Marcin Borchardt, "Call Me Tony" by Klaudiusz Chrostowski, "No Sleeping" by Emmanuel Levy and "Volte" by Monika Kotecka and Karolina Poryzała. In November, "Volte," however, will be shown to the international audience two more times: at the KUKU International Short Film Festival for Children and Youth in Germany and at the 2Annas Film Festival in Lithuania. There, it will appear together with "Polonaise" by Agnieszka Elbanowska. The documentary film by Elbanowska is also included in the programme of the Eastern Neighbors Film Festival in the Netherlands. There, the following films are also invited: "Patriotic Lesson" by Filip Jacobson, "The Ugliest Car in the World" by Grzegorz Szczepaniak and "One Two Zero" by Anna Pawluczuk. You can also watch this documentary film at the Soria International Film Festival in Spain, together with "Euphoria" by Natalia Pietsch. In the first half of the month, the Listapad Minsk International Film Festival in Belarus is also held, where a large number of Polish documentary films are featured. Among them, there are: "Festival" by Anna Gawlita and Tomasz Wolski,"A Stranger On My Couch" by Grzegorz Brzozowski, "Home Games" by Alisa Kovalenko, "Sisters" by Michał Hytroś, "Call me Tony" and "Over the limit" by Marta Prus. In November, the documentary film by Marta Prus will also appear in China at the iDOCS International Documentary Forum. There, you can also watch "Close Ties" by Zofia Kowalewska. "Close Ties" and "American Dream" by Marek Skrzecz will feature at the Cellu l’Art in Austria. The aforementioned "Sisters" will also be shown in November at the Global University Film Awards in Hong Kong and at the Festival dei Popoli in Italy. There, "Second Life" by Eugeniusz Pankov will also be shown. 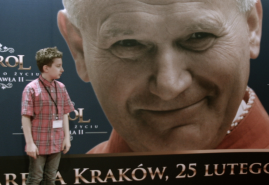 November is also the time of the screenings of the films: "Rogalik" by Paweł Ziemilski at the festival doxs! in Germany, "Leocadia's Dream" by Krzysztof Nowicki at the POFF Shorts in Estonia, "Dos Islas" by Adriana F. Castellanos at the Muestra Itinerante de Cine del Caribe in Cuba and "Borderline Miracles" by Tomasz Jurkiewicz at the Etnofilm Cadca in Slovakia. In November, two screenings are in store for "Desert Coffee" by Mikael Lypinski: at the Annual Red Rock Film Festival and at the Anchorage IFF in the USA. The film "Two Worlds" by Maciej Adamek will be shown in Russia at the Breaking Down Borders, and "The Idea is Paramount. The Architectural Passions of Andrzej Wajda" at the Urban Eye Film Festival in Romania. Undoubtedly, one of the most important events this month are the screenings of Polish films at the festival IDFA. In Amsterdam, the audience will watch the films: "Diagnosis" by Ewa Podgórska, "In Touch" by Paweł Ziemilski,"Summa" by Andrei Kutsil, "Connected" by Aleksandra Maciejczyk, "Dancing For You" by Katarzyna Lesisz, "Unconditional Love" by Rafał Łysak,"Compulsory Figures" by Ewa Kochańska, "Struggle: The Life and Lost Art of Szukalski" by Irek Dobrowolski, "Home Games" by Alisa Kovalenko, as well as "Father and Son" by Paweł Łoziński and "Father and Son on a Journey" by Marcel Łoziński and "First Love" by Krzysztof Kieślowski. The full list of the festival screenings can be found here.